The Mix'It Palette is a new concept based around drawing with Markers. 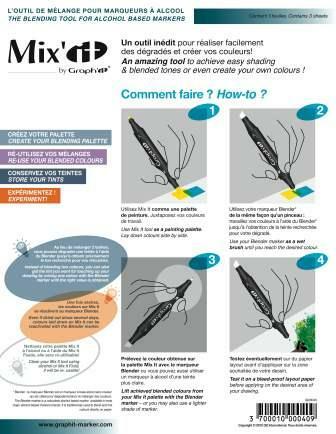 Mix'It is the first blending palette for alcohol based markers. This unique surface is translucent like tracing paper and has a porous coating to allow blending and mixing. You use the Mix It Pallette in a similar way you use a painting palette. Lay your colours down side by side, then use your Blender Marker as a wet brush to mix the colours until you reach the desired colour. You then lift your newly created colour from your Mix It Palette with the Blender marker and apply to your work. If the palette dries simply reactivate your colour by using your Blender marker. This can be done many days or weeks after first creating your unique colour. The Mix'It Palette is untearable and so is very durable and can be used over and over again. The Graph'It 12 Wallet provides a great way of carrying your markers. you simply release the clip and roll the wallet out to reveal your markers. Mix It Fluid is an alcohol fluid that is designed to be used with Graph It alcohol markers. You can use it to create some wonderful effects not normally seen in the world of colouring.